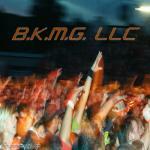 Sign up for Broadjam today to follow BKMG LLC, and be notified when they upload new stuff or update their news! Phalynx is a collaboration between B.K.M.G. (Big Kidz Muzic Production Group) and The TradeMark Experience. Their debut EP, The Phalynx Covenant, is coming soon. The album explores the themes of personal failure, the downfall of society, and the corruption of the music industry. Phalynx is a play on the Phalanx from the X-Men comics. The Phalanx were a cybernetic species intent on assimilating all living beings into their collective. They form a hive mind, linking each member by a telepathy-like system. Phalanx are formed when organic lifeforms are infected with the Technarchy's techno-organic transmode virus. They pass through a lifecycle attempting to infect others before reaching critical mass.